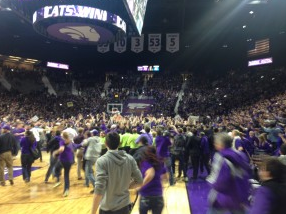 MANHATTAN – KSU Athletic Director John Currie issued a statement on Tuesday apologizing to KU officials for students storming the court following the Sunflower Showdown basketball game. Coach Bill Self and the KU basketball team for the unfortunate situation in which they were placed last night at the conclusion of our basketball game. Our security staff, which in similar past postgame celebrations has, according to our procedures and rehearsals, provided a solid human barrier to allow the teams to conduct a postgame handshake and safely leave the court, was unable to get into proper position quickly enough last night and was overwhelmed by the fans rushing the floor. K-State prides itself on providing a great game atmosphere in a safe environment and did successfully execute our security plan when we defeated KU last year in Bramlage as well as in 2011. Although no one was hurt last night, we fell short of our expectations for securing the court and escorting KU to its locker room without incident. We are disappointed that we did not do better for the KU team. We are reviewing our procedures internally and consulting with our law enforcement partners to determine any steps necessary to improve our gameday security. Additionally, we are actively reviewing video and working in concert with law enforcement to identify any fan who intentionally touched visiting players or personnel. We will take appropriate action with such identified persons, including turning over all evidence to law enforcement so that any applicable charges can be filed. Early this morning I met with Student Governing Association President Reagan Kays and Vice-President for Student Life Pat Bosco who are supportive of these steps. While we are proud of the incredible atmosphere of Bramlage Coliseum and the passion of K-State students and fans, we are saddened by the insistence of some fans to sully the image of our great institution with audible profane chants. We will continue to work with our student leadership to provide a better example of sportsmanship for our audiences.